At some point, you realize you’ve become acclimated to extreme weather. Floridians do this all the time during hurricane season. When they are not lined up 100 deep in checkout lines at Home Depot, gas stations and stores that sell ice. OK…maybe Floridians are not as acclimated as I think. Today’s forecast – called for tornado’s and water spouts on Biscayne Bay. Naturally, we are on a direct course for this excitement – and there is not a darned thing we can do about it. 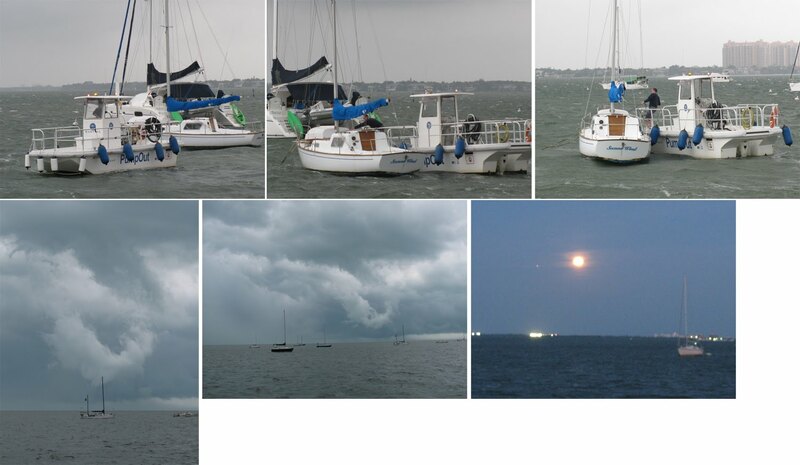 The first batch of squalls caused anchored boats to drag, and float through the mooring field. The Dinner Key marina folks had this one under control – and hauled the adrift boats to another location. The next batch of squalls included the potential tornado. We must have missed it. I’m not complaining. The winds kicked up enough to break our wind speed gauge. The boat shook and rain came at us in horizontal blasts. Visibility nil. Then, it was over. Water spouts developed near No Name Harbor on Key Biscayne. Two helicopters crashed in the Port of Miami. Everyone was safely rescued. All in a day.